Friendship Commanders: THANK YOU FOR DAVE TOUR VI! THANK YOU FOR DAVE TOUR VI! 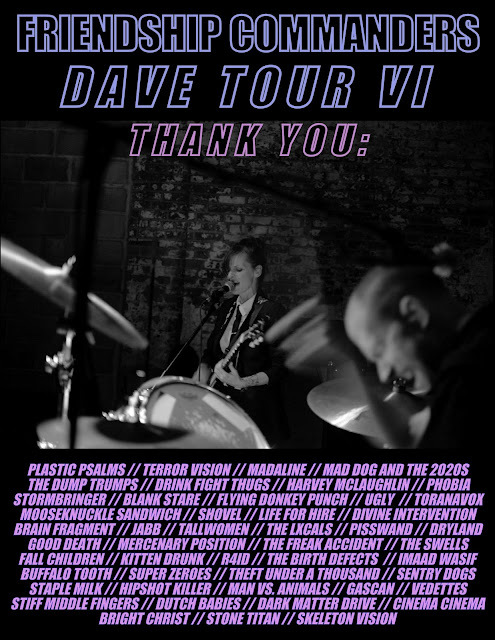 We want to thank everyone who contributed to the success of #DAVETOURVI! Appreciation and thanks to the venues, promoters, friends, people who put us up, fed us, and all who came out to the shows. Special thanks to all of the bands we shared stages with! We'll have more tour dates to share with you soon, as well as this year's Halloween single. Until then, thank you, and we send love and support to all impacted by Harvey, Irma, Jose, the fires, and the earthquake. Stay safe out there.